Harmsen was selected to lead the design team for the creation of the new sites. We provided the surveying and engineering, and assembled a team of subcontractors who provided landscape architecture, wetlands delineation, electrical engineering, and geotechnical engineering. The first step in the process was to create an accurate survey map of existing park features, including campsites, cabins, roads, restrooms, utilities, trails and pathways, and the day-use area around the lake. Then, wetlands were identified and mapped. They are important because they serve critical functions such as improving water quality, capturing and storing carbon dioxide, intercepting storm water runoff, and providing wildlife habitat. In addition, they are protected under federal law. Flowing Lake sits approximately 150’ lower than the hills surrounding it, and there are a number of wetlands within the park boundary which filter water draining into the lake from adjacent hills. The next step in the process was for the Parks Department team to select candidate locations. More surveying was done to create detailed maps of each location, including significant trees and topographic features. Geotechnical studies were done to evaluate the viability of the locations. Next, Harmsen engineers, working with the landscape architect and electrical engineer, designed the sites, which include water and electrical hookups. 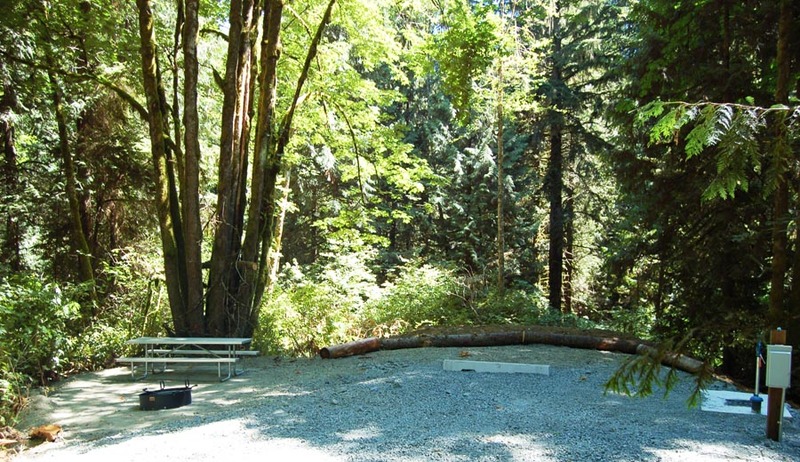 Park campers enjoy the feeling of camping in the woods, so removal of trees was minimized and legacy trees were retained wherever possible; forested areas were left between sites for privacy. Many of the sites were on sloped ground, sometimes necessitating tiered campsites in which the campfire area is at a different level than the parking area, separated by a rock wall, and often accessed by stairs. When the Harmsen team's design work was complete, the project went into construction. Finally, the new sites were numbered, added to website map, and opened to the public. Here's a photo of one of the new campsites. Get out there and camp! Visit the park webpage for more information: Snohomish County Flowing Lake Park.